Island visited by 18 members. 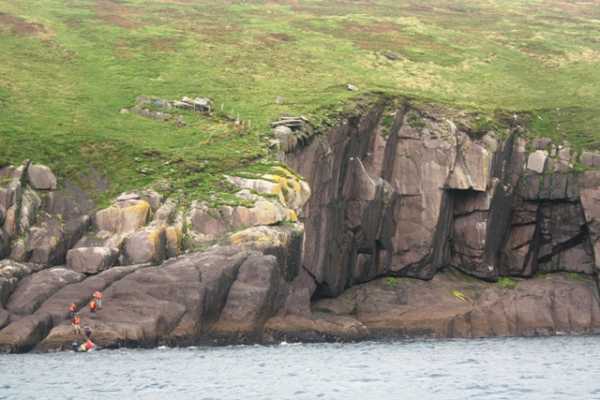 The remarkable form of Inis Tuaisceart seen from the mainland, which resembles a recumbent human figure, has given rise to several names, such as An Fear Marbh ('the dead man'), 'the Bishop' and 'the Sleeping Giant'. 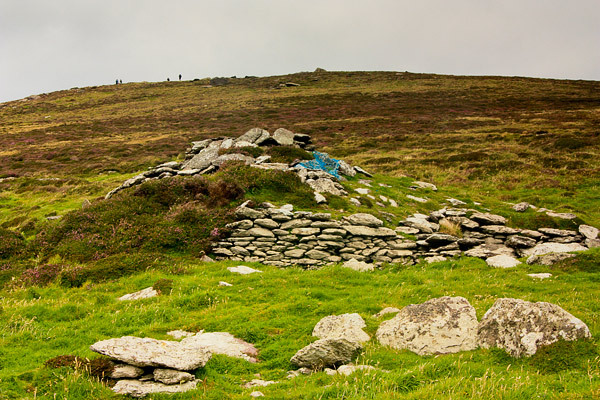 To the south of the island's summit lies an early Christian structure known as Teampall Bréanainn or St. Brendan's Oratory. Inis Tuaisceart is the 1434th highest place in Ireland. Inis Tuaisceart is the 4th most westerly summit in Ireland. From the summit of Inishtooskert the grass and heather slopes lead gently down to the east. The grassy slopes end abruptly, at steep and rocky cliffs and crags. 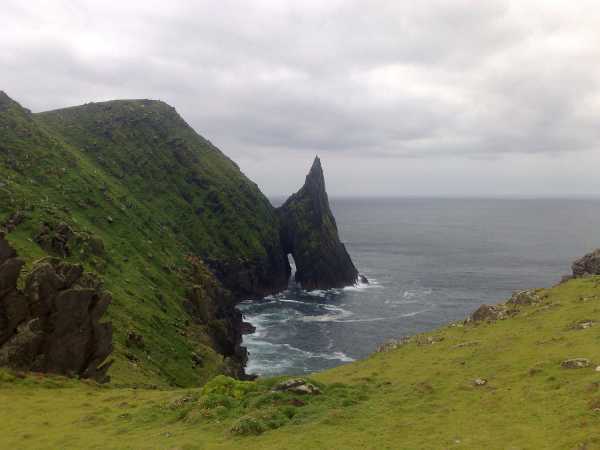 We accessed the island at at a point where a 10 metre scramble up the rocks brought us to the grassy slopes.The western side of Inishtooskert is fully exposed to the Atlantic, and has cliffs and sheer slopes that reach from sea level up to the 172 metre summit. Remains of two small settlements can be seen on Inishtooskert, including some old beehive huts. However there appears to be little or no shelter on the island, so life would have been very tough in bad weather. Inishtooskert has no pier, jetty or other manmade boat-landing appartus. Our boat, the Blasket Princess under the skillful command of Mick Sheeran, stopped a few hundred feet offshore, and we took turns loading into the dingy to be whisked to the islands' rocks. The dingy literally pulls up onto a sloping rock and Matt's able assistants aided us to individually clamber onto the sloping rock. From here it was a 10 metre scrambe using both hands to reach the slightly less steep grassy slope above. Another 20 metres of steep grassy slope and eventually the slope eased off, from where it is was a straightforward ramble over sheep-cropped grass and heather to the summit. The prescence of the sheep mean that the island doesn't have the long difficult heather and grass of Inis na Bro. However Inishtooskert does have an abundance of dead birds which are most likely the result of seagulls. The sheer amount of carcasses led many of the group to wonder if it wasn't mink or larger birds of prey at work. However the remains of wings and legs seems to be the trademark leftovers of a seagull feast. Picture from simon3 : Building on one of the few flatish pieces of the island. Picture: Building on one of the few flatish pieces of the island. Oratory with a possibly grizzly story. At around Q23335 00380 B you will find a cluster of buildings, a minor monastic ruin, marked at St Brendan's Oratory. There is a round corbelled building, sunk well into the ground, with a hole, presumably for smoke, at the top. This pleasant island has numerous habitation remains of the minimalist variety. How these hardy individuals managed to eke out an existence here leaves much to the imagination. 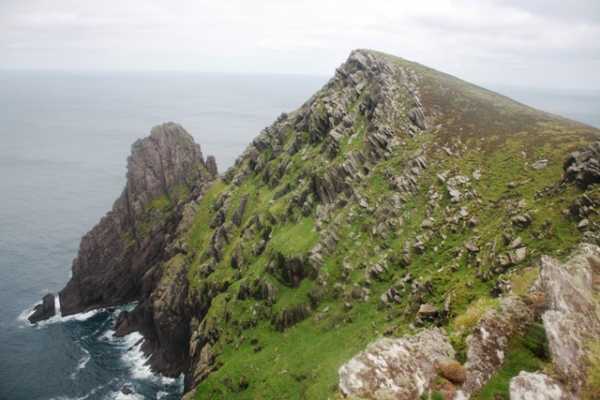 The western cliffs are severe and unyielding as can be seen in this photo looking south west from the col at the northern end of the island.